New Year’s Resolution: Let your intentions be known! Having just returned from a short time away, I’ve been thinking a lot about vacations. Vacations make no promises. What we immediately think of as periods of recreation, they commit to nothing more than the act of vacating one space for another. Yet to be away for even a short period of time can be therapeutic and refreshing, regardless of how many deep tissue massages or rounds of golf are on the docket. There can be fixed plans- meeting up with friends at a predetermined location, attending a sporting event at a fixed time. Even spontaneous road trips can be fixed when you plan even remotely ahead of time. On the other hand, preplanned road trips can be spontaneous, when the GPS malfunctions or someone has an allergic reaction to their veggie burger and requires Benadryl. No matter how much you plan ahead of time, life throws curveballs, fastballs and knuckeballs daring you to adjust the game plan. Driving back from South Florida on Thursday night, I had a car full of Holzer ladies sleeping soundly through the second leg of a 5 hr journey home. Long drives remind me of when I ran cross country in high school- no walkmen to blast music, just time to think. While I was thinking about the sermon I had wanted to write a week ago, a car zoomed up beside me. Realizing that his lane, the right lane, was somehow moving under 90 mph, the driver decided to create a previously unopen space between my car and the car in front of us. I honked for a moment, proceeding to a take a look at the license plate of the car now nestled in front of me. 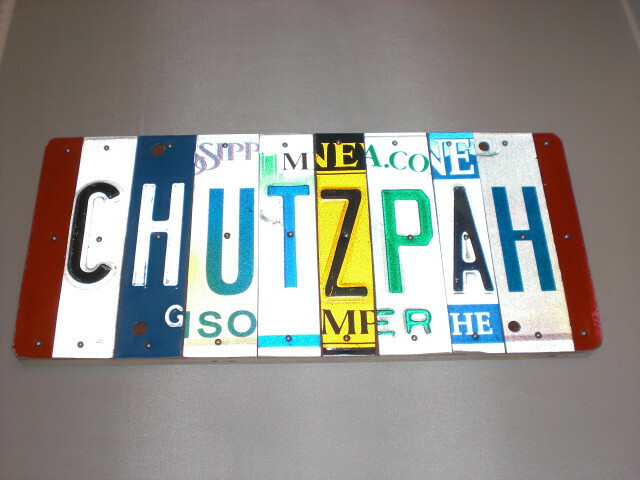 H, U, T, Z, P, A, H. Hutzpah. I thought to myself, well he did warn me by clearly stating his intentions with a license plate like that! Our sages teach of a balance between Keva, fixed, and Kavanah, the spontaneous. While we may focus on their relationship vis-à-vis prayer, that as 11th century moral philosopher Bahya Ibn Pakudah stated, “prayer without kavanah is like a body without a soul,” the balance is vital to the fulfillment of mitzvot as well. To be so obsessed with process without allowing room for purpose, mitzvot will lack meaning and intention. “Joseph named the first born Menashe because, ‘G-d has made me forget all my troubles and even my father’s house'” (Genesis 41:51). Has Joseph assimilated into Egypt? Yes. But son #1 is a constant reminder of what he’s supposedly forgotten. “He named his second son Ephraim because “G-d has made me fruitful in the land of my suffering” (Genesis 41:52). Assimilated into Egypt? Maybe not so much. A somewhat spoiled, self-centered, pretentious young man is now the man honored by the king with the compassionate task of feeding others. Once again, the text is straightforward. They said to one another, “Alas, we are being punished on account of our brother, because we looked on at his anguish, yet paid no heed as he pleaded with us. That is why this distress has come upon us.”They did not know that Joseph understood, for there was an interpreter between him and them. And how does Joseph respond? He turned away from them and wept… But he came back to them and spoke to them; and he took Simeon from among them and had him bound before their eyes. He’s almost there, allowing his private emotions to become public. This will be the key to his brothers opening up to him…but then we go back to this master plan. As a reader, I keep thinking, “he’s gonna blow this chance again.” Joseph hides behind the process, waiting for the plan to unfold rather than letting his intentions be known. While we can ask why Joseph did not reveal himself earlier, it’s hard to ignore the power of his emotions at that moment. Whatever plan this is, whatever Joseph has built up in his mind, it almost destroys the potential for renewed relationships with his brothers. From every word and every action, the bitterness towards his brothers continues through the plan he has set out. Commentators explain that this was all a master plan to not embarrass his brothers. However, Joseph’s emotions speak volumes as to how he really wanted this all to go down. Joseph’s unadulterated tears break the curse. Moving forward, Joseph is able to provide for his family during the years of famine- food and land for his brothers, burial needs for his father. But the text never speaks of an embrace with his brothers again. There is reconciliation, just not the founding of a new healthy relationship. Joseph was too caught up in the fixed plan, the formality of Egyptian society, that he almost misses out on the much needed moment of healing. We sit here on Erev-Rosh HaChanukkah, the eve of a new year. It’s a time in between last minute donations and those first minute resolutions. We look during these liminal times to recommit ourselves to causes, to lifestyle changes, to fostering friendships or a stronger work/life balance. We are all well-intentioned people, but life gets in the way and sometimes, we don’t hit a bullseye, or even the target itself. These yearly markers are, in essence, no different than a random Tuesday in the middle of the summer. We can plan to make a call to an old friend for the next holiday or birthday, or we can make a call tonight. If you’ve been holding in, waiting to find a time to reconnect, connect and just spit it out already. We can plan to visit someone on the mi shebeirakh list when our “schedule allows,” or we can send a note to let them know we are thinking of them. Don’t wait for the perfect plan to take shape. Things will undoubtedly come up, but within the pockets of time filled with the mundane, fill those with intention.We have to learn to get over ourselves. Show our intent through our words, our gestures, and our actions. Intention is not everything, but it is vital to our relationships to share it with others. Be transparent. Be raw. Be real. Tonight we finally end 2016. Scientist were even kind enough to add in a leap second to this tumultuous year. For many this was a, “ughh” year- we lost family, friends, sports icons, rock and movie stars; we lost our fantasy football championships thanks to Dez Bryant’s heroics. This was the year that lacked civility, the year plagued by hidden government plots and politic agendas- we continued to demand more transparency. And yet, for all the transparency we desire from our leaders, we should demand the same for ourselves, expecting nothing less from our own relationships. In this age of speaking you mind, really whatever is on your mind, it is imperative that we speak from the heart. The modern miracle of Hanukkah is not that the oil lasts for 8 days, but that there are Jews who continue to be committed to lighting it again each and every day. When the lights go out, we fill the chanukkiyah with new candles. We are partners in that miracle. We may usher in a new year amidst the mitzvah of Hanukkah- pirsumei nissa, the publicizing of the miracle. As Joseph gave in to his emotions, so too may we publicize our intentions, our hopes and our dreams for the coming year. Shana tova im kavana– a year of health, happiness, and intention for us all. Posted on January 2, 2017, in Hazzan's Monday Morning Quarterback. Bookmark the permalink. Leave a comment.